"The doll comes with pads? That's so weird." That's the opinion of the dad in the ad below, who likely echoes the view many parents will have when they hear that Lammily, the first fashion doll made with realistic proportions, is about to become the first doll ever to come with pads and a period party pamphlet. 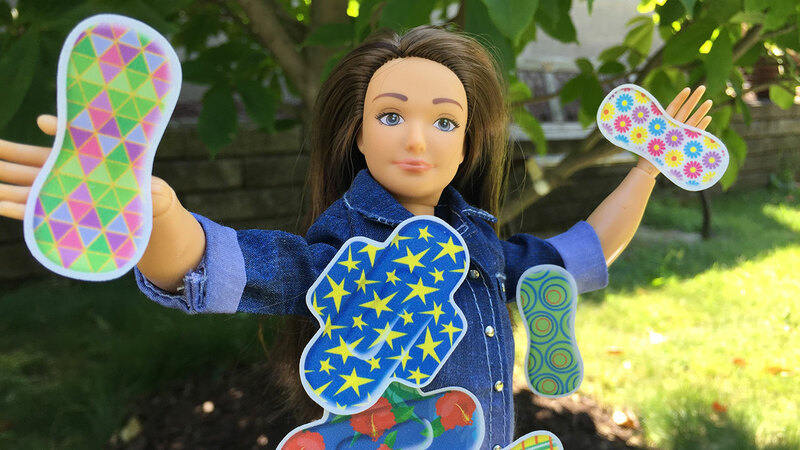 "When I've talked with moms about it, they either love it or they think it's incredibly weird," Nickolay Lamm, inventor of the doll, told AdFreak this week. "But once they learn more about it and see the actual product, they think it makes a lot of sense." And it does. Lammily is supposed to be a normal 19-year-old girl. And what's more normal than getting a period? Besides, Lammily already comes with a pack of realistic marks that include freckles, acne and cellulite. But we all know there's a cultural taboo around periods specifically. "The whole goal is just to try to start a conversation about it and make it seem less taboo," says Lamm. How, you ask? With the time-honored genre of white people rapping, an advertising phenomenon that we've covered extensively over the years. Comedian Matthew Kyle wrote the script, and Tony Yacenda directed, cast and cut the spot, in which two well-meaning parents attempt to teach their daughter about puberty with a fun, hip rap and a jug of cranberry juice. Their older daughter then suggests the doll might be a better way to go about it. After all, there are dolls that wet themselves and dolls that come with toothbrushes. There are even toys that give birth to babies. A doll who gets her period shouldn't be that weird. Even Lamm's mom, who found it weird at first, liked the idea more and more as they talked about it, and she actually ended up designing the period pack herself. The one problem with the ad is that, in focusing on how shameful, embarrassing and awkward it is to talk about periods, it runs the risk of reinforcing the taboo instead of breaking it down. There's not as much pride here like in the HelloFlo ads. On the other hand, it does lampoon the awkwardness, and the daughter undercuts the parents' hangups. Also, the product is a step in the right direction. Lamm doesn't think one ad, or one doll, will change the world, but he does have high hopes. "Maybe it'll help us get to a point where people are just as comfortable buying toothbrushes as they are buying menstrual pads," he says. Still, he knows a lot of people aren't there yet. Casting took a while, in fact, because many parents weren't ready to have the talk with their young daughters yet. As Lamm puts it, "We were fortunate to find someone who was cool with it." Knowing how taboo the topic is, Lamm says he doesn't have a clue how the ad will be received, but he's passionate about helping young people have a healthy, normal body image. Why? Because Lamm himself suffered body-image issues in high school, starving himself and exercising to exhaustion to get six-pack abs. "At the end of the day, you have to actually care about something for people to care about what you do," he says. "We care about this issue and about anything that has to do with body image." Which is great for those of us who want a healthier doll alternative, or who just don't want to subject our children to the taboo subject of suburban white rap.